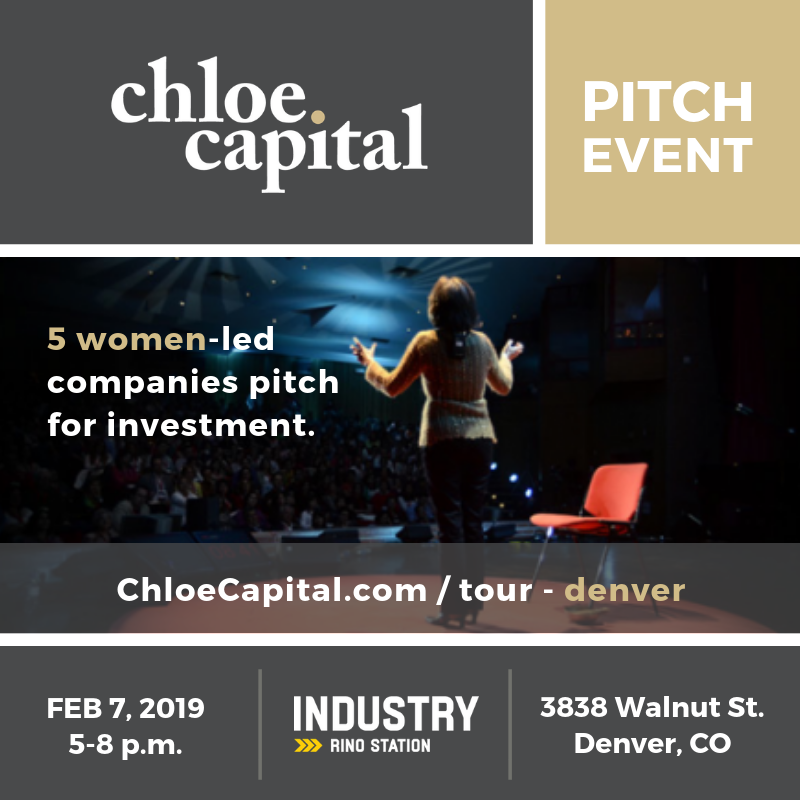 (RELEASE) Denver, CO – On Thursday, February 7, 2019, five of the top women-led tech companies in the nation will present their businesses to a room full of investors and community leaders during the Denver Women Investors Forum (ChloeCapital.com/tour-denver). We invite all media representatives to shine a light on this movement for equality in entrepreneurship. Geospiza, Lilu, Pagedip, Zeta and VNTANA (company descriptions below) were selected from a national pool of over 1000 applicants. One of these companies will receive an investment from Chloe Capital. The company will be chosen during a pitch event from 5 – 8 PM at Industry RiNo Station, located at 3858 Walnut Street, Denver, CO. Supportive male allies are welcome and encouraged to join us. Tickets are on sale at CHLOESdenver.eventbrite.com. According to Pitchbook, female founders receive only two percent of all venture capital in the U.S. Yet studies show, companies with female founders perform better than those of their male counterparts. On February 7, Chloe Capital aims to help women entrepreneurs with funding, connections and mentorship. “Our mission is to advance solutions to the gender gap in entrepreneurship, added Chloe Capital Partner Kathryn Cartini. “We further this mission by investing in women-led companies, increasing the number of women investors at the table, and uniting a genuine community committed to supporting women. Prior to the pitch event, accredited investors and women leaders from the five companies will connect for an invite-only Investor Dinner and Workshop. World-class speakers will lead enrichment programs focused on localized investing in women. Featured speakers represent Social Venture Circle, Next Wave Impact, Rockies Venture Club, Women Who Startup Foundation and more. Accredited individuals interested in attending the Investor Dinner and Workshop can reach out to Chloe Capital for an invite at info@ChloeCapital.com. Geospiza’s software tools and services help emergency managers, first responders, and corporate leaders make data-driven, evidence-based decisions that reduce risk, enhance resilience, and strengthen communities. Lilu builds technology to empower new moms. Their first product, the Lilu Massage Bra, is the first pumping bra with automated massage that gives moms the benefits of breast massage, 100% hands free and hassle free. Looks like a website, acts like a document. Pagedip is a content creation tool for the modern world. From 360º videos, interactive forms and more, Pagedip turns traditional flat documents into media-rich narratives. Zeta combines, education, advice and accountability into one personal finance platform for couples. From paying off college debt, to preparing for your first child. Zeta’s mission is to help couples get smarter about money. VNTANA’s patented AR platform provides the only interactive holograms with data collection. The results wow consumers while quantifying their engagement. Clients include Pepsi, Nike and Microsoft. The Denver Women Investors Forum is part of the Chloe Capital National Tour. In addition to Denver, CO, Investing Workshops and Pitch Events are scheduled in Chicago, IL, and Binghamton, NY. Women-led companies ready for venture funding should apply at ChloeCapital.com/tour. Both It’s By U and Nineteenth Amendment have already been selected to pitch our co-investing partner, Astia Angels, for follow-on funding. Chloe Capital would like to thank our City Champions: P2B Investor, Peak Impact Consulting, Project X-ITE, Women’s Investor Network and the Women Who Startup Foundation.